Superconductivity, a macroscopic quantum effect, has two characteritic lenght scales : the coherence lenght ξ, corresponding to the distance between two electrons in a Cooper pair, and the London penetration A challenging question is the following : what happens when the size of the superconductor tends to be comparable to one or both of these scales ? How is the superconducting state affected, if still existing ? 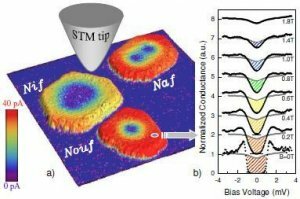 To answer to this question, we perform STM /STS experiments on lead nanoislands grown on silicon in UHV conditions. For this study, we selected a particular island - a single crystal of almost ideal hexagonal shape (Fig.2a). 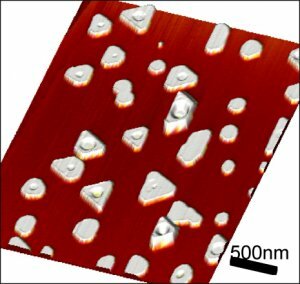 We noticed that the very small thickness of the island (5.5 nm, only 19 mono-layers of lead) and the « rough » island-substrate interface increase the electron scattering, leading to very large changes of the two characteristic lengths. Thus, the effective value of the penetration length λ is 2000nm, compared to 50nm for the bulk. This is 15 times the diameter of the island ! The consequence of this change is notable despite strong screening currents circulating around the island (Figure 2b). The superconductor loses its ability to expel the magnetic field - the Meissner effect no longer exists ! 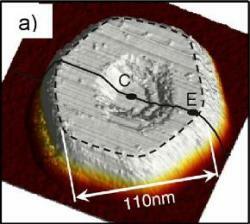 However, the coherence length ξ shrinks to less than 40nm, compared to 80nm for the bulk. This is more than 1/3 the diameter of the island, which a priori can accept one vortex but any other one. For type II superconductors, ξ is smaller than λ, the magnetic field can penetrate in the material via flux quanta called vortices. Each vortex consists of a nanomer core where superconductivity is destroyed (on the scale of ξ), while around the core on a typical radius of the order of λ circulate super-superconducting currents. On superconducting material to another the two scales ξ and λ vary within a range from 10 to 1000 nm. In bulk superconductors, vortices spontaneously organize in a triangular « Abrikosov » lattice (Nobel Prize in Physics in 2003 for its prediction) due to their mutual repulsion caused by flux interaction and their respective currents. In nano-islands which size is of the order of a limited number of ξ, vortex may exist. In fact, if a number Nmax ≈ (d / ξ) 2 of vortices penetrate in the material, normal vortex cores overlapping leads to disappearance of superconductivity. In extreme cases such as d ≤ ξ vortices can not enter at any time. Fig.2. 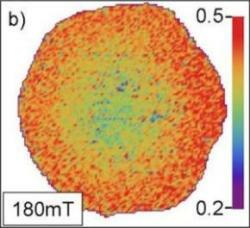 a) The selected nanoisland for STM study of vortex confinement I ; b) STS measurements show non-uniform disappearance of superconductivity in the island under magnetic field (here 180mT), due to Meissner currents on the border. Indeed, a single vortex appeared at 0.24Tesla in the center of the island. The presence of the vortex is a direct signature of the quantum condensate rotation, despite suppression of the Meissner effect ! When rising the magnetic field up to 0.45 Tesla, the island transits to the normal state whithout a second vortex penetration. What we observe here is indeed a « single vortex box ». This is a unique case separating two distinct situations : if the size of the island is slightly larger, then the island would accept two or more vortices. At the contrary, if its size is smaller, then the island would accept no vortex at all. For the first time, we direclty observed a quantum confinement effect, that was predicted since 1965 : the vortex lattice fusion in a unique giant vortex induced by confinement. Each vortex being associated to one flux quantum of magnetic field, the resulting giant vortex vorticity consists of a multiple of the single vortices vorticity. Providing a lateral confinement, such a behavior is expected in every kind of condensates : superconductors, helium superfluid, Bose Einstein. Fig.3:STS image of 7 atomic layer thick -hundreds of nm wide- lead islands. Under magnetic field, superconductivity ( in violet) is progessively destroyed and vortices (in red) appear in the center of the islands. The small one accepts one vortex, the medium accepts two vortices and the larger exhibits a giant vortex.